Anyone the least familiar with the Bohemian Grove has come across the claim that the 40-foot stone owl is a reference to Moloch, associated with child sacrifice in the Bible and rabbinic tradition. The owl, however – to the Bohemian club, as well – has traditionally symbolized wisdom. 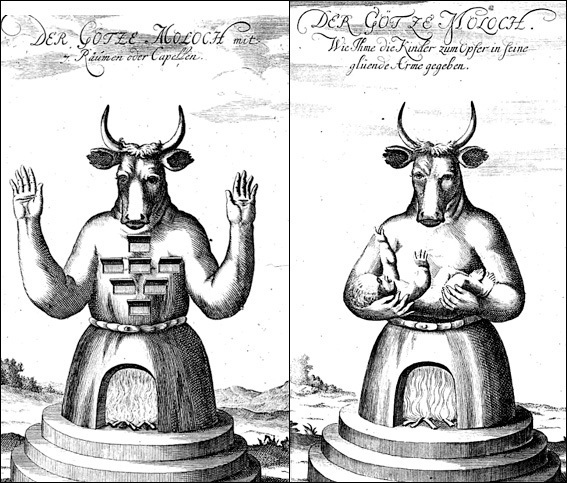 While there’s no ancient description of what a Moloch idol actually looked like, relatively modern representations have invariably depicted a bull-headed statue. Throughout history, in fact, not once was Moloch ever associated with an owl – until, that is, the age of the internet. I’d initially surmised that Alex Jones was the first person to put the Moloch spin on the owl. In 2000, as we know, he snuck into the Grove, videotaped the Cremation of Care ritual, and became an internet superstar – and rightly so. Numerous times in his film, Alex matter-of-factly states that the Bohemian owl represents Moloch. The first conflation in book-form appears to be David Icke’s The Biggest Secret (Feb. 1999), a little more than a year before Alex Jones, Mike Hanson, Jon Ronson and “Rick the lawyer” had infiltrated the annual elite summer encampment in July of 2000. A local community newspaper, The Santa Rosa Sun, reported in July 1993 about the Cult of Canaan and the legend of Moloch at Bohemian Grove, but police investigations into alleged murders on the site have predictably led nowhere. The last paragraph is key to finding out where the theory had originated. Should the Cremation of Care ceremony so quickly be dismissed, given its occult nature and historical antecedents? This ceremony resembles the ancient Canaanite worship of the idol, Molech. Like the Owl of Bohemia, the ancient Ammonite idol Molech was a towering larger-than-life edifice. Whereas the Owl is solid, the bronze Molech was hollow. Molech worship consisted of the ritualized sacrifice of the first-born infant son of every Ammonite newlywed family. Building a fire in the belly of the beast until the flames poured out of the mouth, the high priest mounted a scaffold and tossed the first-born male child into an aperture in Molech’s chest, to the incantation of drums and droned liturgy of the priests of Molech. Technically, Owl worship, as it is practiced at the Grove, is somewhat different from Molech worship. Peter Weiss, writing in Spy Magazine, November 1989, states, “Bohemian Club literature . . . boosts that the Cremation of Care ceremony derives from Druid rites, medieval Christian liturgy, the Book of Common Prayer, Shakespearean drama, and nineteenth-century American lodge rites.” Is this the straight goods, or is it PR sugar coating of a darker sacrificial rite, terrifying even on a symbolic level? John DeCamp’s book, The Franklin Cover-Up, includes Paul Bonacci’s testimony about a snuff film of a child being murdered on July 26, 1984 in California in “an area that had big trees.” At a meeting in Santa Rosa, DeCamp told a group that he had edited out Bonacci’s references to an enormous, moss-covered owl and men in hooded red robes because he not know then about the owl at the Grove and thought it “too far fetched for people to believe.” In the fall of 1992, Paul Bonacci was shown a black and white photo of the moss-covered owl at the Grove and quickly identified it as the site of the July 1984 snuff film described in DeCamp’s book. Although this testimony has been available to law enforcement officials since mid-October 1992, no official investigation has been made. A casket christened “Dull Care” and borne, like the passing of Arthur, in a boat across the lake could be a symbol, also, not only of “cares of the world,” but of caring itself. The denizens of the Grove, as a collective body, are the ruling class and upper echelon bagmen who make and orchestrate war – the modern Molech. It would make sense to immolate caring, conscience and the consequences of their business transactions, lest they take responsibility for millions of souls around the globe whose lives have been affected by wars of Yankee Imperialism in the twentieth century. Seems the most explosive allegations about the Grove are included in the Moloch narrative from the get-go. However, Evans didn’t go so far as to state that the owl at the grove is a representation of Moloch – that would be left to later embellishments on the internet, in books, and film – only that there are similarities between the Cremation of Care ceremony and what little we know about the Moloch worship of antiquity. As the author of the original article [published simultaneously, in July 0f 1993, in the Santa Rosa Sun as “Inside Bohemian Grove,” and in the North Coast Xpress as “Bohemian Bigwigs Perpetuate Canaanite Cult,”] that suggested an equation – of sorts – between the “Owl of Bohemia” and Molech, I’d like to put my own two cents into the pot. In the first place, I am glad that the occult nature of the “Cremation of Care” ceremony has begun to receive the attention that it deserves. The Masters of War at the Bohemian Grove are nasty customers, and all their works are evil. On this point, both the Left, and the Right wings of the anti- New World Order forces, can agree. Alex and company were the first to actually capture footage of the famous Cremation of Care ritual. But it was a quick in-and-out operation. Fearful of being made, the infiltrators retreated after the conclusion of the opening festivities. In the 1980s a few journalists managed to spend days in the Grove, publishing articles about their experiences. The first was in 1980. Mother Jones sent Rick Clogher, whose report appeared in the magazine a year later: “Bohemian Grove: Inside the Secret Retreat of the Power Elite” (Mother Jones, Aug. 1981). A screenshot from Alex Jones’ film on the Grove, in 2000. At the time, speculation on the internet was rampant as to what in the world in could mean. 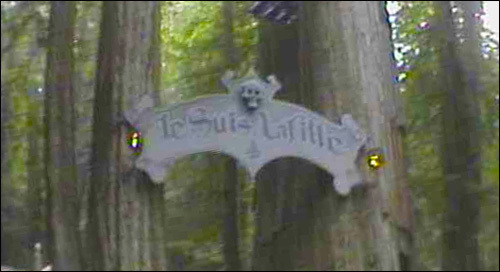 It turns out that Alex had filmed the entrance to the featured Grove play for that year: ‘Je Suis LaFitte,’ by James C. Crimmins, about the famous pirate. The most detailed article about the Grove, in a mainstream setting, was Philip Weiss’ “Masters of the Universe Go to Camp: Inside the Bohemian Grove,” Spy Magazine, November 1981. Like Clogher, with the help of Mary Moore, Weiss snuck in; and spent a week there during the 16-day encampment. The Cremation of Care is a ritualized sacrifice of an effigy of the body of the Dull Cares of the world. Dull Care is understood to mean the accumulated stresses, boredoms, and sins accumulated by each Bohemian during the past year. This effigy is cremated upon the altar of Bohemia at the foot of the Owl Shrine. The Shrine is a forty foot tall Owl Deity that symbolizes “…all mortal wisdom…” (Annals of the Bohemian Club vol. V: 431) and is the tutelary deity of the Club. Through the process of conducting this research, I came to an understanding that the Cremation of Care is a formal ritual that functions as a group catharsis for those that participate in it. Alex Jones and Jon Ronson had similar views about the revelry of the participants they had witnessed during the ceremony. This is a really impressive and informative article. Thank you for linking to the 1996 article–to think that one misunderstood piece of work could serve as the foundation of an entire school of thought. I remember being confused about which animal representing Moloch–was it the owl or the bull, or something else? This really clarified a lot for me. I look forward to reading more of your articles! It’s fitting I guess that the internet was the source and the method by which to clear up the misconception.